"...the rage of the weed-whacker has not been heard from for over a month now. Nobody, not even the workers who once rejoiced in weed-whackers, mention them; the scythe has clearly been universally accepted. Given how workers typically cling to ingrained procedures, this is an enormous achievement!" This little 'scythe success story' began when permaculture teacher Scott Pittman taught a course at the Sat Yoga Ashram in Costa Rica, and suggested that they 'need a few scythes on the place'. Trusting his advice, they did some research and decided to contact us. In mid-January I shed my long johns and travelled south to swap the snow for the heat of tropics, not looking forward to that part of it -- because excessive heat has never been my cup of tea. But I was surprised that up there high in the mountains, with nearly constant breeze present, a northerner could actually function. The ashram is situated amidst the breathtaking scenery of a cloud forest and though it was the 'dry' season, the landscape was green and growing vigorously. And much of it -- in line with the ashram's objectives -- needing to be cut. The objectives are twofold: One is to maintain a very diverse, permaculture-style ecosystem where edible crops are interplanted in creative patterns with ornamentals and native flora. Obtaining material for compost making, mulch and erosion control is an ongoing task. The other objective is the ashram's obsessive manicuring of certain portions of the grounds -- and those were maintained in accordance to the dictate of the "American Lawn Culture". Such a lawn can indeed be cut with a machete, but only at a great cost to some humans' comfort and health. Nevertheless, I did witness much excellent machete work during the first half of my month-long stay there, and it was impressive. These men keep their machetes sharper than I saw anywhere else. The daily routine consists of scraping (not filing or grinding) the edges -- lengthwise -- with a tool self-made of a sideways-tapered 12" file, its one side shaped to a knife-like profile. This, in a way, can be likened to the grinding of Scandinavian, British or American scythe blades, except the steel is removed lengthwise and no grindstone is needed. Then the edge is finished on a stationary water-lubricated stone. In the field a smaller version of the 'scraper' is carried along and used as needed to mend the frequent nicks (because a machete's edge, more typically aimed downward, 'finds' more earth and rocks than does a scythe blade in experienced hands). Following this maintenance routine, I was told that the ashram's workers, on average, wear out (or break) 2-3 blades, each, per year. In view of the combined outlay ($5-10 apiece) for such a short period of use, the cost of a scythe blade (provided it is obtained through dealers who do not triple its FOB price) seems to offer a very good EROEI. But hopefully, at least in this one place, that is now over. Here each of the workers exhibits a different posture. The nearest one is probably leaning over momentarily to pick up some trampled stems, the middle one is in the average 'comfort zone', and Rolando (furthest away) seems to be angling his tool so as to trim a side of a steep ditch. Note the heaps of grass behind them, piled up in short spells between, and nearly simultaneously, with the actual cutting. Previously, the machete or strimmer-scattrered vegetation required more work to gather for removal to composting sites, with much of it remaining behind. And, it is a beautiful place. I had never before mowed where the equivalent area was so diverse with regards to topography, variety of plants and spacing between what was not to be cut. And it is a 'land of ditches'. Even the few relatively flat patches are rimmed or crossed with drainage ditches from a few inches to two feet in depth, all covered with vegetation that is periodically trimmed. New tree seedlings continue being planted and need to be 'protected' from disappearing in the sea of wilderness. There are raised or wood-framed garden beds with very narrow paths between them and floral designs rimmed with immaculately managed grass. The banks along the roads of this whole property (that only four wheel drive vehicles can navigate) are from two to 'infinity' high, and in places virtually vertical. One of many examples of a snath with multiple grips. Such specimens are 'a piece of cake' to make, and as you can imagine, the left hand has more options as where and how to hold the snath than the actual grip per se. While 'setting-up' a scythe the "ideal" lay of a blade becomes a joke. All in all, this is a paradise-like terrain for a scythe-swinging person who likes diversity. Our friend Niels Johannsen from Denmark -- the most creative mower, when it comes to scythe-wielding techniques that I know of -- would be in 'seventh heaven' there; he'd have done all that work with his one and only snath -- the one that in much of his daily work travels through his hands as if it were alive. A portion of the snath/blade combinations I left behind. But to meet the needs of more common people along with these diversified tasks, I ended up making nearly 30 snaths of different sizes and with grip positions breaking many normal rules. Some snaths custom-fit for those steep banks were not much longer than their long (80 cm) stiff blade, and some had 3 or 4 grips, plus (as the need called for it) were meant to be held in more positions than that. I was glad that Ashoka, one of the yogis, had fashioned a 'shaving horse' before I came, and that two of the workers were commissioned to gather a large heap of snake-shaped branches of trees they routinely trim. Thus there was material to work with in order to make both grips and shafts in an infinity of shapes. Not many turned out typical-like. It so happens that I enjoy working with such a diversity. And between what Jagdish initially took home from our place and what I brought additionally, I had ample room for fooling around with blades/snaths fitting. The inventory of blades included products of scythe industries from Austria, Germany, Italy, Russia, Slovenia and Turkey, and they ranged from short and heavy (or light) to long and light (or heavy and stiff) and with diversely-set tangs. Here a Costa Rica-born woman -- the chief mind behind the truly perma-cultural flavor of the ashram grounds -- is showing a fine bodily posture (but not one that in that terrain can be maintained for very long without various shifts). One notable thing regarding 'blade suitability' was that not too many mowing sessions into the experience, the two most talented of the mowers (Parvati among the yogis and Rolando among the workers) came to appreciate the blades of the lesser weight, and overall, the 'grass' models were used far more than the heavier (per length) 'bush' blades. I was also surprised how few nicks ended up on the blades' edges in all that challenging terrain with some rocks in most places. Rolando -- the supervisor of the workers, a talented jack of all trades, but who initially seemed very reserved about the scythe's introduction -- 'made' one of my days when (as we worked near each other on his third morning of the hands-on experience and he was trimming a shallow ditch with graceful diagonal strokes) he exclaimed, more to himself than to me: "THIS IS AN AMAZING TOOL". I was surprised how practically all of the seemingly (visually) 'tough' vegetation could be cut with a scythe. Here some dry sorgum-like plant, allowed to die and partially lay down, is easily handled with a 45 cm/300gram blade. "This morning, like many these days, included a delightful hour of mowing in the stillness as the sun broke over Bodh Gaia. You can imagine it well. Not so far away Roy and Parvati are usually found cutting the grass somewhere around Hridaya. The agricultural team will soon be joining us. You’ll be pleased, though not surprised, to know that the rage of the weed-whacker has not been heard from for over a month now. Nobody, even the workers who once rejoiced in weed-whackers, mention them; the scythe has clearly been universally accepted. Given how workers typically cling to ingrained procedures, this is an enormous achievement!" The blades' edge maintenance proved to be less of a challenge on this place than I expected, perhaps because bulk of the students are already sharp-tool-using men. Rolando took to the freehand peening like fish to water, and even two of the yogis (Parvati and Kalyan) were not far behind. Here is the robust Michael at the task. Text and photos from Peter Vido, and used with permission. 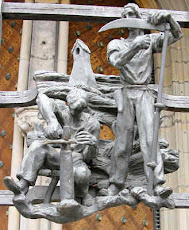 The Windrow, Newsletter of the Scythe Association of Britain and Ireland, No. 11, March 2016. The Scythe Comes to Arunachala.